Place half the eggs in a bowl, sprinkle with salt and pepper and whisk to combine. Heat a large non-stick frying pan over high heat. Add half the butter and swirl until melted. Pour the egg mixture into the pan and swirl to coat the pan. Cook for 1–2 minutes or until the egg is just cooked and the bottom is golden. Slide onto a plate and keep warm. Repeat with remaining eggs, salt, pepper. 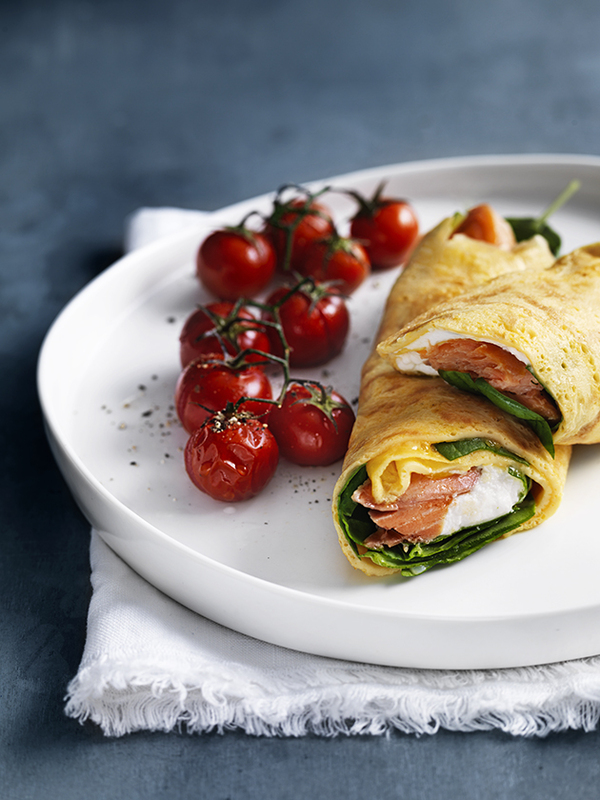 Top the omelettes with baby spinach, goat’s curd and trout. Roll to enclose and serve with roasted tomatoes+. Serves 2. Tip: To roast the tomatoes, place 300g vine-ripened cherry tomatoes in a small baking dish, drizzle with 1 tablespoon of extra virgin olive oil and sprinkle with salt and pepper. Cook in a preheated 200°C (400°F) oven for 10 minutes or until softened. + You can fill your egg roll with whatever toppings you like – we also love sage-roasted pumpkin sprinkled with fresh ricotta.